Here is a card I made for one of last weeks VSN challenges. This challenge was to create a white card. We were allowed to add some color to the main image. 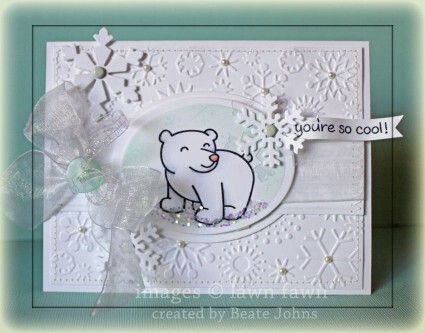 I chose the cute ice bear from Lawn Fawn’s Critters in the Snow. It was stamped in Tuxedo Black Memento Ink on a piece of Neenah Solar White cardstock cut and embossed with a Classic Oval Nestabilities die. The bear was shaded with Copic Markers (R00, R20, C00, No, N1) and the background was sponged lightly with Tumbled Glass Distress Ink. Smaller snowflakes from the Critter set was stamped in second generation on the background and the bottom was covered in Chunky Crystal Crafty Sparkles. Another piece of white cardstock was cut and embossed with the next size up Classic Oval Nestabilities die. A 4″ x 5 1/4″ piece of Solar White cardstock was embossed with the Snowflake Embossing Folder. The edges of the embossed layer were stitched before the oval was adhered in the center. A 2″ x 5 1/4″ strip of white cardstock was scored with in 1/8″ increments with my Scor-Pal and adhered over the oval. White organdy ribbon was tied around the horizontal layer and topped with a button that was tied on with iridescent curling ribbon. Snowflakes were cut out of Acetate and white cardstock with the Whimsy Snowflake die . Some snowflakes were added to the layers with white brads. A sentiment from the Critters in the snow was stamped on a thin strip of white cardstock, formed in a banner and attached to the oval with a layered snowflake. Small pearls were added to centers of some of the snowflakes. The layers were adhered to the card base, a 5 1/2″ x 8 1/2″ piece of white cardstock, folded in half. Gorgeous card Beate! Love the pearls on the snowflakes. I loved seeing your whilte card as I am now working on a set of white cards for a friend and thinking of doing all my holiday cards in black and white with one color as it goes so much faster! :<) And I love the look! The little Ice Bear is so cute – I wish I could purchase new stamps every day! He is SO cute and I LOVE the glitter around his feet!!! I do not have a single LF set…I need to rectify that! LOL!! This is so beautiful with all that white!! and the image is just adorable! So pretty and clean looking…LOVE IT! Love all the white with just a hint of color here and there! Makes a very impressive statement! Oh my goodness, this is soooo cute! I need to send my sister and winter birthday card and you’ve given me great inspiration with this!!! I just love all the white and that image is adorable! he is just too cute, love your embossed background with him! beautiful white on white look. 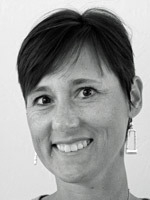 super card, Beate! This card is so cute Beate, very beautiful.